Because nothing says “I love you,” like two pounds of cheese. Last year, the hubs decorated a pack of kid’s Valentines and put a favorite memory of us on the back of each one. You should totally start planning now. Otherwise your significant other will end up on the receiving end of an “I love America” flag-covered card. In the spirit of planning early, these chocolate covered beauties take about one week to set. So, wait until your honey is gone for a few hours and get to work. Pat cherries dry with paper towels; set aside. In a small mixing bowl, combine the sugar, butter, corn syrup, and salt; mix well. Turn onto counter and knead until smooth. It takes a bit of stirring and prodding, but the crumbly mess does eventually turn into one round blob. Knead it with your hands until it does. Just do it. Roll dough into 1/2 inch balls that are about the size of a marble. Flatten each into a 2-inch circle with your hand. Wrap each circle around a cherry and lightly roll in hands to cover. Place cherries with stems up on waxed paper-lined baking sheets. Cover loosely and refrigerate for 1 hour.In a heavy saucepan, melt one half of the chocolate chips; stir until smooth. Take off of the heat and add the other half; stir until smooth. 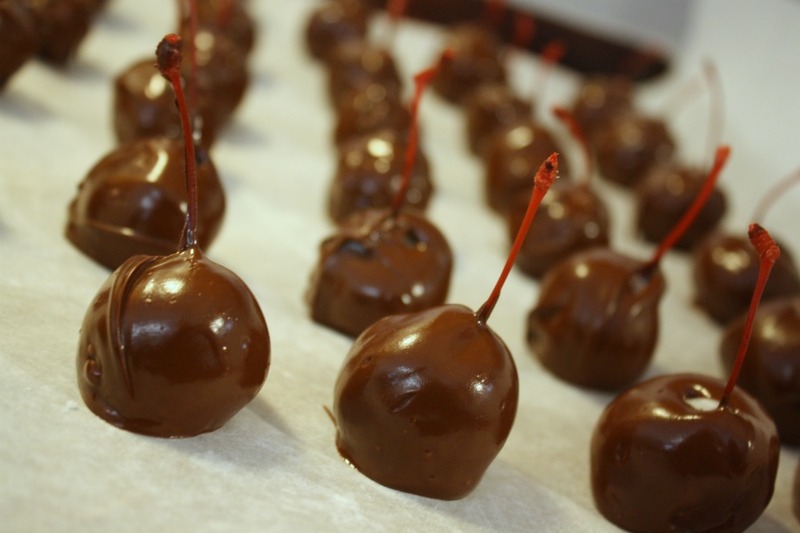 Holding onto the stem, dip each cherry into the chocolate; set on waxed paper. Refrigerate until hardened. Store in a covered container and refrigerate for 1-2 weeks before serving. Take out about 30 minutes before you’re ready, and serve at room temperature. This entry was posted on Monday, January 30th, 2012 at 8:30 pm and is filed under Desserts, Holidays. You can follow any responses to this entry through the RSS 2.0 feed. You can leave a response, or trackback from your own site. Yum Yum! I have to think of something tasty to make for valentines day. It might be a bit hard because at least attempting to be healthier. Oh my…this is heavenly sinfully delicious!! What a wonderful little treat this will be for Valentine’s Day! I think I have just enough time to make this!! This sounds heavenly!!! Would love to make this for a happy treat for girlfriends on a girls night out!! Yum, when I try them, I’ll let you know how they come out! !